With it being Good Friday, myself and Janders booked into the silvers only match at Summerhayes. 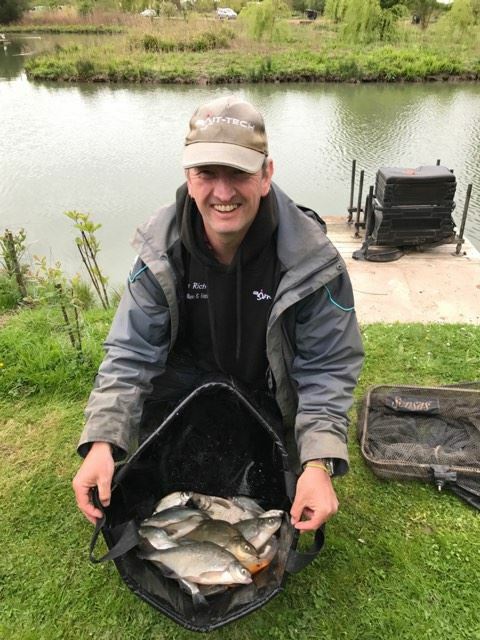 Jeff Sparkes has been running the Friday matches with all the winners qualifying for a Champion of Champions match in October and because of the Bank Holiday there was a good turnout of 18 anglers. 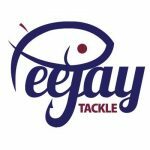 Jeff announced the draw and said all the odd peg numbers were being used today so everybody would have spare pegs either side. I went in the draw bucket early for a change and grabbed a ball but didn’t look. 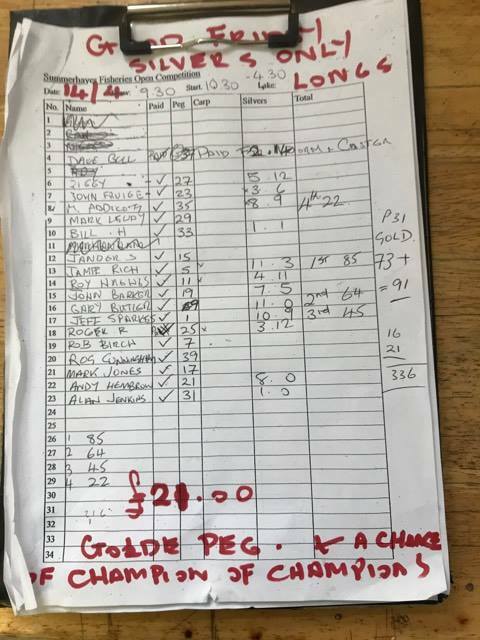 As people were telling Jeff their peg numbers so he could write them down, I kept an eye out for peg 7 which I really don’t like, Rob Birch pulled that one out, I fancied 37 or 39 but both were taken early on. Janders was on 15 which can be okay but is another carpy corner, I decided to have a look and was gutted when I saw I was on peg 5 on cyanide straight. 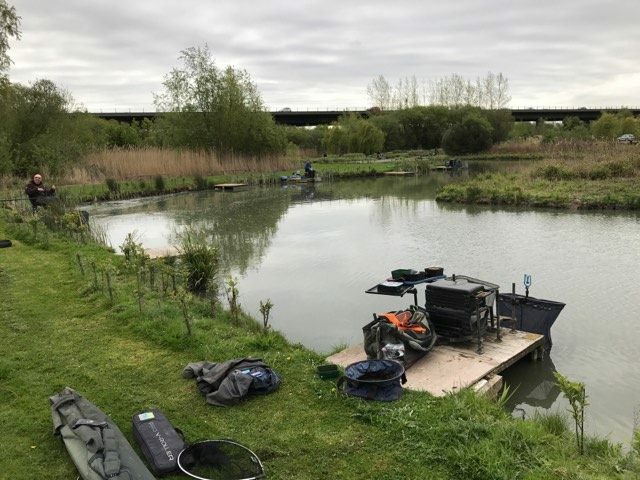 Jeff was on peg 1 and was fairly happy with that, my mood improved slightly when he said peg 3 wasn’t in so we had a nice big gap and with quite a few anglers on the lake, extra space could make a big difference. I set up a 14 x 11 MW F1 Slim for three lines at 10 metres and one at 5 metres plus a 0.3 gram NG Mini Gimp to fish top two plus one on the inside. As always I had 4mm Bait-Tech Xpands for the hook and some Carp and Coarse micros for feed that I soaked the night before using water with a glug of the Juice. I also mixed up a little groundbait and added some dead red maggots. On the whistle I cupped in a small amount of micros on the inside and at 5 metres before putting in half a pot on the middle and right hand 10 metre lines, finally two balls of groundbait went in on the left hand line. I started on the inside but wasn’t confident as I hadn’t had a bite there in the last match on Longs, I intended to give it ten minutes to allow my other lines to settle but a tentative indication peaked my interest and when I had a 4oz skimbob shortly after, I decided to give it a bit longer. Next chuck I hooked a 5lb carp which wasn’t ideal but as I landed it without too much fuss, I thought I’d give it another go. The next bite saw a decent fish tear off and I was just about to curse another carp when it stopped and then a big skimmer, probably 2.5lb, came to the top before I netted it, things got even better when I had a 12oz golden tench next chuck and another hand sized skimmer put me over 4lb and we’d only been fishing 45 minutes. Then it was back to earth with a bump as my next two fish were carp and the second one managed to snap my hooklength in the landing net so after tying on a new one, I picked up the other rig and went out to 10 metres for the first time. 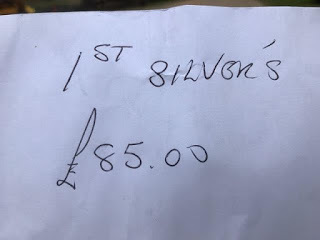 I’d seen Jeff land a couple of better silvers, Rob had already hooked a couple of carp and Gary on peg 9 was catching the odd skimmer as was Roy Hughes on peg 11 but as far as I could make out, I was doing okay at this early stage. It took a while to get my first bite on the longer line, which of course I missed, I hit the next one and another decent skimmer had me thinking I could be in for a good day. I should have known better as over the remainder of the second hour I only added a few small skimbobs from the two longer lines I’d fed with micros and I never had a bite over the groundbait. As always I wanted to leave the 5 metre as long as possible before trying it but during the third hour I only added a few more small fish and it felt like Jeff was pulling away from me, Rob had also landed a couple of decent skimmers and Gary and Roy were still getting odd silvers. I had a couple more 4oz skimbobs but then looked up to see Jeff attached to a big flying skimmer and then Rob had one too! I had another quick go on the inside and Janders walked up and said he hadn’t had any skimmers yet but had several carp. He left me to it and as he walked away, the float sailed away and I was into yet another carp, after landing it, it was time to try the 5 metre line for the first time. I had 3oz skimmer quite quickly and then had a little run of fish, mainly small skimmers and a couple of small roach before hooking a decent skimmer that came flying out the water but I safely netted it, next chuck I had one about 8oz and I didn’t think there was much between me and Jeff. But then the carp moved in and despite swapping lines, they were being a right pain and it was the same for everyone judging by all the elastic I could see when I looked around. Going into the last hour, I thought I had about 7lb (and 30lb of carp! ), I had a few more blades from the 10 metre line but after another carp put in an appearance, I came back in on the 5 metre line for the last 15 minutes, I had a couple of small skimmers and then a better one which was all rough, ready for spawning, I checked my watch and there were still a couple of minutes left, I had another 3oz fish and still had time to miss another bite before Jeff signalled the all out. I ended up with 27 fish (all skimmers apart from that tench) and a few little roach which I hadn’t counted and when Jeff asked what I had, I said about 7lb but hoped it might be a little more. He was admitting to 10lb and I was pretty sure I didn’t have that. 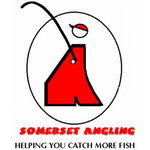 I packed my kit up and loaded the car before catching up with the scales, a quick look at the weigh board revealed Martin Addicott had the best weight so far with 8lb 9oz from peg 35, Ziggy had 5lb 12oz from 27 and then Roger weighed 3lb 12oz on peg 25, John F had 3lb 6oz and then Andy Hembrow came close with 8lb from peg 21. John Barker had 7lb 5oz from 19 and then Mark on 17 and Janders didn’t weigh. Roy Hughes had 4lb 11oz from peg 11 and then it was Gary Butler’s turn, he was admitting to 6lb and said whatever he weighed I had double that! He weighed a level 11lb and had sneaked them in because I thought he’d struggled and I knew for sure I didn’t have 22lb! 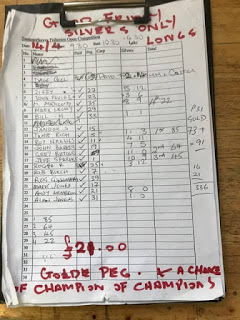 Rob didn’t weigh and then it was my turn, I was hoping I’d done enough to frame but after tipping my fish into the weigh basket, they were all saying it was close and my weight was called at 11lb 3oz! I was still convinced Jeff had beaten me though and when he pulled his net out I thought he had but again it was close and his weight was called at 10lb 7oz so I’d done it! 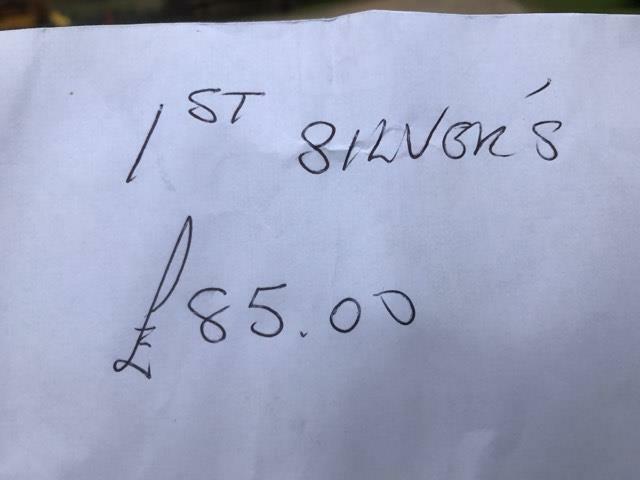 Back at the results I was called out in first place and had a nice pick up of £85 plus a place in the final later in the year.